present(sensor_id, V_UNIT_PREFIX);  // Custom unit message. Not sure if this has anything to do with it, but you should not use V_UNIT_PREFIX as a parameter in the present function call. The function expects a sensor-type and not a value-type. I suppose you could use S_CUSTOM instead. @freynder I'll comment that out, it was only needed for Home Assistant, I added it to get the right type of chart. But still, the crash itself happens after presentation? 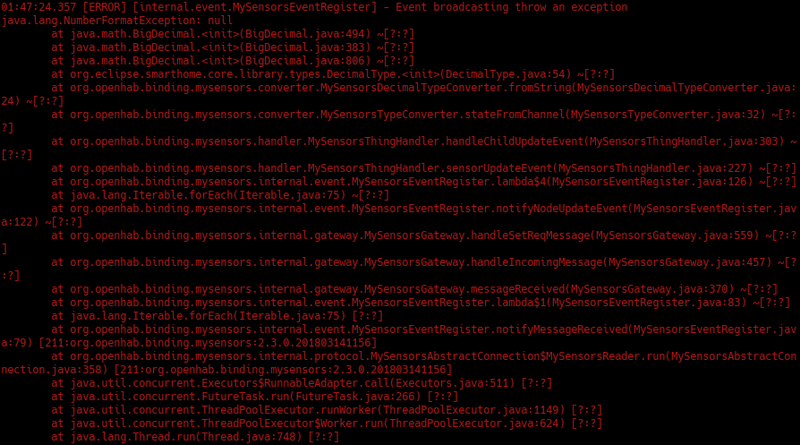 It turns out that V_UNIT_PREFIX is not supported by OpenHAB's MySensors binding.